Bruin Basketball Report | UCLA Bruins Basketball: Will Pauley Pavilion Get Facelift Soon? Will Pauley Pavilion Get Facelift Soon? When one drives northbound on the 110 Harbor Freeway near Exposition Park in Los Angeles - a massive building construction looms across the way. Although the building is no more than 100 feet tall it is already beginning to cast a dark shadow 20 miles westward towards Pauley Pavilion. The building is the Galen Center - the new home of the USC Trojans basketball and volleyball teams beginning with the 2006 season. The $70 million plus (it's already over budget) arena will have 10,258 seats - and 22 luxury suites which will cost from $30,000-50,000 annually. In addition to the revenues from the suites USC has already sold over $6 million in arena seat licenses. Over in Westwood eleven UCLA Bruins men's basketball championship banners proudly hang down from the rafters of Pauley Pavilion. The arena that John Wooden built. Literally. Built in 1965 under the auspices of Coach Wooden, Pauley Pavilion was constructed without seats near the court since Wooden believed it created an unfair home-court advantage and a hostile environment for visiting players. Pauley Pavilion is a multi-purpose arena used by other sport teams on campus and also serves as a student intramural facility. Pauley Pavilion is considered hallowed ground by many college basketball fans, yet the arena lacks in many amenities from both a spectator and player's perspective. For fans attending a basketball game, there are huge open spaces at the ends of each court separating it from the arena seats, per Wooden's initial wishes, but which tends to distance fans from the game action and players. In some rival arenas, like Duke's Cameron arena, the students and fans are right on top of the court which adds to the personal experience and excitement of the game. The concessions stands look exactly the way they did back in the 60's and have limited food offerings. The concessions and bathrooms are located on only two sides of the arena so one could be walking a long while before something is found. The arena seats are cramped with most of them angled awkwardly from the court requiring one to crane their neck to watch the game. Just as importantly, the facilities at Pauley Pavilion are no better for the players. The locker rooms look like, well, locker rooms. In this modern age of college basketball, other elite programs have locker rooms with all the modern amenities and comforts. In addition while other schools have separate practice facilities for their basketball team , the Bruin basketball squad has to compete with other intra-school interest for court time since Pauley Pavilion is also the team's practice court. Pauley Pavilion has not undergone a major renovation since it was built 40 years ago. And although it is one of the most recognizable and honored arenas in the country- it is a less than ideal facility especially in this modern age of sports. Will UCLA ever renovate Pauley Pavilion? In 2003 when Ben Howland was deciding whether to move to UCLA from Pittsburgh he said, "It can be a tremendous home court (Pauley Pavilion). But renovation has got to be done. Even if it means playing a year at the Forum or wherever". Howland added, "At our facility (Pitt had just built a new arena), the students surround the court. It was built so they can stand the entire game and not impede the view of the paying public who sits behind them. You want to maintain the ambiance and sense of history, but you have to upgrade." Three years later? It's still being talking about at UCLA. In October of last year, Athletic Director Dan Guerrero went into a meeting with planners to discuss renovation for Pauley Pavilion, and although estimates were never officially announced (some estimated it to be about $40-50 million), the amount was more than expected due to upgrade needs and increased costs of construction which caused the administration to reassess their plans and priorities. Corporate naming rights were even considered to help with funding, although it appears this is no longer an option being considered at UCLA. In May of this year, UCLA athletic director Dan Guerrero finally announced he hoped a fundraising strategy for the renovation of Pauley Pavilion would be in place by the end of 2005. "We're hoping to get the scope of the project done by the end of the summer, at which time we would begin to seek an architect to look at design elements, and things of that nature," Guerrero said. "We're being very deliberate with all of the planning relative to the facility. "Among the improvements being considered are better fan amenities, including concessions and restrooms, upgraded locker rooms and moving the seats closer to the court, Guerrero said. "Once we get to the point that we know exactly what we're going to do, then we embark on a funding strategy, and the need to raise all the dollars to complete the project," Guerrero said in May. "In my mind, the soonest we can begin to develop a funding strategy and embark on some kind of campaign could be some time in the latter part of this year". But Guerrero added at the time - no firm time table exists to start the project. In an article this week in the L.A. Daily News, UCLA Athletic Director Dan Guerrero announced plans to renovate Pauley Pavilion were underway, saying. "We'll give it (Pauley Pavilion) a fresh new look inside with new everything. We'll likely center the court. We'll bring the end seats to the court itself." He then announced that a second phase of renovation would begin in which a new arena level would be created under Pauley Pavilion in which new player locker rooms, practice court, media room, and booster stadium club would be added. This sounds like an interesting plan, but there are still no architectural renderings nor has a time table been set for the renovations to begin. In other words, we've heard this before. No one can be sure if UCLA loses any recruits to other basketball programs due to the condition of Pauley's facilities since many feel that recruits are attracted to the allure of a program and facility with such a glorious basketball past. "Pauley Pavilion today is still a facility that can attract great players," Athletic Director Dan Guerrero said at a press conference in May. For most people, including recruits, opposing players, and fans walking into Pauley is like entering into a shrine - a holy basketball shrine. And perhaps that is where the problem lies. Everyone knows Pauley needs to be improved but are in no rush to change such a beloved "shrine". When Peter Dalis, the prior athletic director retired, he admitted that Pauley had needed to be improved for years but figured it would need to be demolished and replaced with a new stadium - not wanting such a legacy for his tenure - he never touched Pauley. 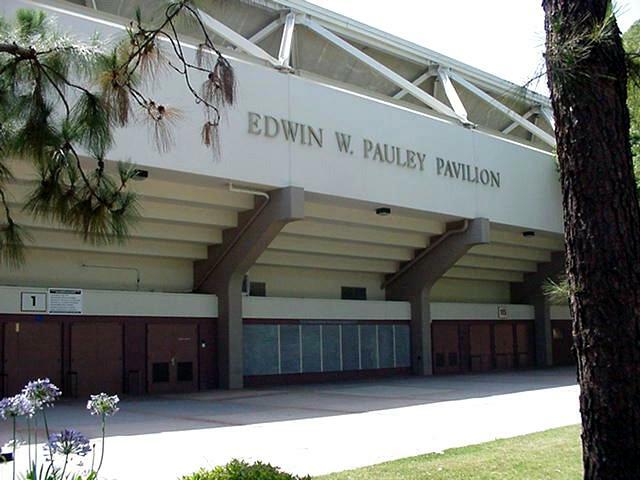 Fortunately the present plans for Pauley Pavilion are for a renovation of the famed building rather than a replacement. Let's hope Dan Guerrero can start and finish this big job. And as Coach Ben Howland has intimated, let's hope it's sooner than later. Note: Below is a great link to a Pauley Pavilion plan and design that UCLA Urban Design put together for the administration a number of years back. It probably is not part of the current design plans for Pauley Pavilion but it is interesting nonetheless to see what had been discussed in the past. Answer to quiz: John Wooden lost only two games in Pauley Pavilion.